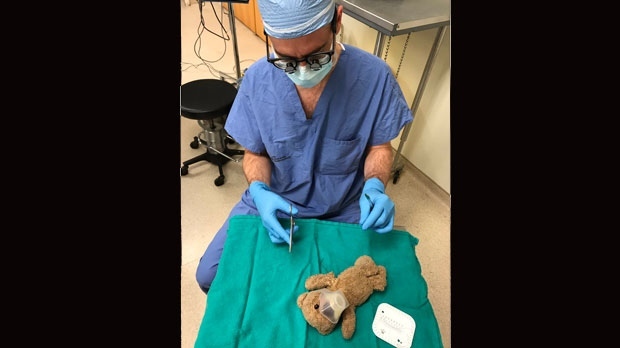 HALIFAX -- A Halifax neurosurgeon performed a career first when a young patient asked him to stitch up a beloved teddy bear while the boy recovered from surgery. Dr. Daniel McNeely has looked after eight-year-old Jackson McKie since he was an infant, and said he couldn't say no when the boy asked him to fix a tear in his fluffy friend right before his surgery last Thursday. The doctor used leftover stitches from McKie's procedure to patch up the bear, Little Baby, while a medical resident at Halifax's IWK Health Centre snapped a photo of the heartwarming moment. McNeely posted the photos to his Twitter feed (at)pdmcneely, writing "Patient asks if I can also fix teddy bear just before being put off to sleep ... how could I say no?"